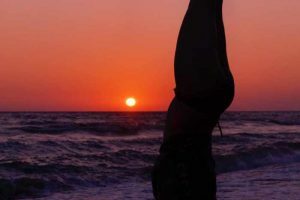 The Asanas are situated at the beginning of the learning process of yoga: they constitute the first part of hatha-yoga and the third part of the astanga-yoga of Patanjali. The Asanas are physical exercises that have the purpose to prepare the body and mind for the next stages of yoga: pranayama, pratyahara and dharana. The body and mind are maintained in good health and trained, in a way that creates the necessary equilibrium (samatvam) of various functions. A kind of reconditioning of the psycho-physiological mechanisms of the body, understood as a whole, takes place. The next step is the stadium of asanajaya, the perfect mastery of the asana: this can happen after a long and intense practice of the asana. At this point it is possible to sit for long times in a meditative asana without feeling uneasiness or discomfort. The asanas have fundamentally the purpose to oppose the ahgamejayatva, the instability due to disturbing factors (viksepa) in the tonic rhythms of the body. Every unbalance of muscular tone is removed through the practice of asana. The asanas go to the root causes of such unbalance, as the trembling due to emotional conflicts, stress, tensions, etc. In this way, the asana moulds the body and mind, making them stable and perfectly capable to sustain the spiritual efforts of the following steps of yoga.